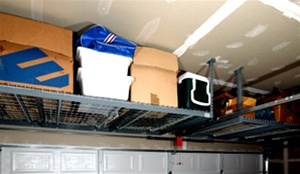 Our overhead storage racks, or ceiling storage units, are based on a unique, patent-pending design available in 4 different sizes and two different height adjustments. This means easily adjustable configurations to meet individual needs. 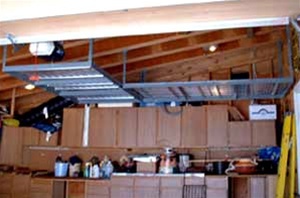 This is the only overhead storage system on the market that provides homeowners with a commercial grade product featuring a steel box frame and industrial wire decking. Clear some valuable floor space by utilizing that overhead space and organize your clutter. See through wire decking allow you to locate out of the way items easily, and an open frame grants you access from any side. 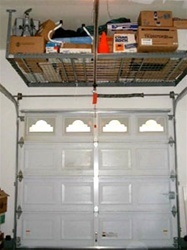 Up to 8' wide openings for storing long and bulky items. Hangs down up to 45" from your ceiling. Up to 112 cubic feet of storage in our 8' x 4' unit! 14 gauge powder coated steel frame with wire decks. Professional installation available in some areas, call for details.